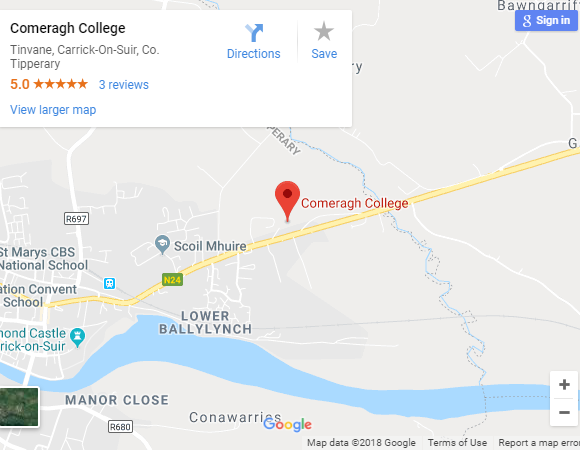 At Comeragh College we aim to provide a quality education for life in an innovative, responsive and caring learning environment. In our school, students can attain the highest standard of excellence, academically and in all other aspects of their school activities. We are a co-educational post primary school. Academic excellence is promoted in a caring environment. It has been at the centre of life in Carrick on Suir for almost 90 years. The school aims to provide a high quality education which caters for the diverse skills and aptitudes of our school community. We are committed to the care and development of each individual in a happy and safe school atmosphere which offers children and young adults opportunities to develop as good citizens, proud of their inherited values and beliefs. Our school operates on the premise of due respect for the beliefs of all. Our School is a community where students, staff and parents work together to support each other.